Carlos Gardel (11 December 1887 or 1890 – 24 June 1935) was a singer, songwriter and actor, and is perhaps the most prominent figure in the history of tango. His birthplace is disputed between Uruguay and France. He lived in Argentina from the age of two and acquired Argentine citizenship in 1923. He grew up in the Abasto neighborhood of Buenos Aires. He attended Pio IX Industrial high-school located in the Almagro neighborhood of Buenos Aires. He died in an airplane crash at the height of his career, becoming an archetypal tragic hero mourned throughout Latin America. 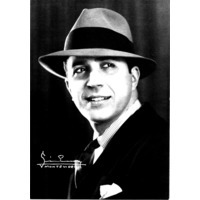 For many, Gardel embodies the soul of the tango style. He is commonly referred to as "Carlitos", "El Zorzal" (The Song Thrush), "The King of Tango", "El Mago" (The Magician) and "El Mudo" (The Mute). The unerring musicality of Gardel's baritone voice and the dramatic phrasing of his lyrics made miniature masterpieces of his hundreds of three-minute tango recordings. Together with lyricist and long-time collaborator Alfredo Le Pera, Gardel wrote several classic tangos, most notably: Mi Buenos Aires querido, Cuesta abajo, Amores de estudiante, Soledad, Volver, Por una cabeza and El día que me quieras.